Wrinkles and sagging skin on your face can make you appear old, tired, and worn out. For patients looking to take control of their facial appearance, Dr. Chan at Reviance Portland® Plastic Surgery offers ultherapy treatment– the only effective non-surgical facelift available! Ultherapy is a new technology that utilizes focused ultrasound technology to first visualize then treat the skin’s deep support structures. This procedure gradually strengthens the skin from within to create just the natural lift and toning you desire. There is no incision and no down time. Ultherapy treatment can be performed right in Dr. Chan’s office with only ultrasound gel applied to your skin. The ultrasound image allows our providers to visualize the level of treatment before ultrasound energy is applied to the targeted tissue. Treatment can take from 45 to 90 minutes, depending on the area to be treated. Patients may experience mild burning sensations, which can be controlled with an oral pain medication. Some patients see immediate results, but optimal rejuvenation can take 3 to 6 months. Can I afford Ultherapy treatment? The cost of Ultherapy depends on the number of areas treated. Pricing information will be provided at your personalized consultation. Reviance Portland® Plastic Surgery also offers a variety of financing options. If you have sagging skin and wrinkles, but aren’t yet ready for invasive plastic surgery, you should be considering Ultherapy treatment. 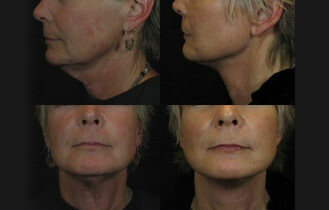 Check out Reviance Portland® Plastic Surgery Ultherapy before and after photos to see the results you could achieve.